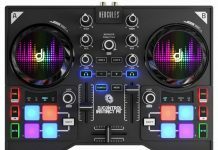 Hercules Launches 3 New DJ Controllers: The DJ Control Inpulse 300, DJ Control Inpulse 200 and DJ Control Starlight! Hercules seems to be in the middle of a big makeover. Not only their site got a much-needed refresh, but they also launched 3 brand new controllers! 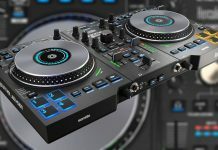 The DJ Control Inpulse 300 adopts a very “industry standard” look, looking like many other entry-level controllers on the market today. 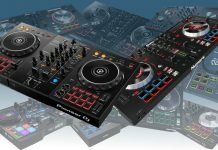 This means two decks with 8 performance pads per decks, large, touch-sensitive jog wheels, a 3 band EQ and filter on the mixer and basic input/output (master RCA output and headphones). The Inpulse does offer a few innovative features. The biggest stand out is a beatmatch guide, that consists of onboard lights under the jog wheels and the pitch fader to indicate how to best manually beatmatch when mixing two tracks. Since this controller is meant for beginners, this is quite a smart idea, as beginners will certainly find some help useful. The best part of this deal is the price. The Inpulse 300 will cost USD 199, which is around USD 50 less than most of its direct competitors. 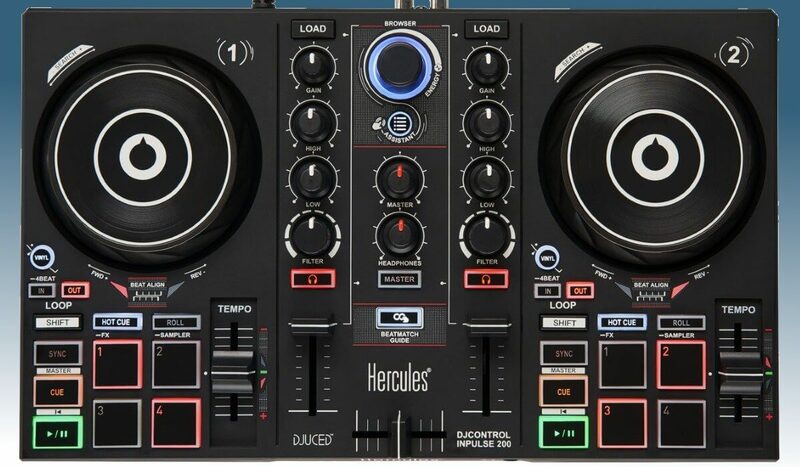 The Hercules DJ Control Inpulse 200 is the smaller version of the Inpulse 300. There are fewer performance pads (only 4 per deck, against 8 for the Inpulse 300), and the EQ section is limited to a two-band EQ (high and low). What is retained, is the beatmatch feature: small lights under the jog wheels and next to the pitch fader to indicate how to best move both in order to beat match two tracks. The price remains very competitive: the Inpulse 200 will cost USD 99. Then, finally, we come to the last new DJ controller. 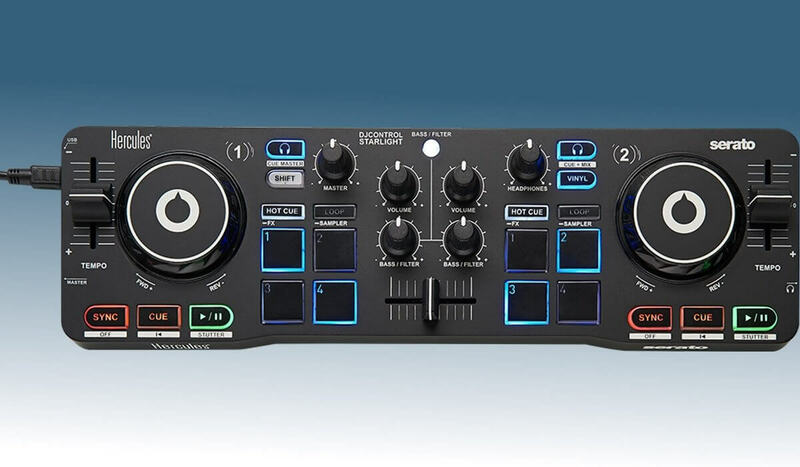 The Starlight is not a DJUCED controller but works with Serato DJ Lite instead. It’s very compact and light, but still has jog wheels, 4 performance pads per deck, a gain knob, a bass/filter knob (you need to chose between both) and a pitch fader. All this for USD 79, that is not a bad deal. 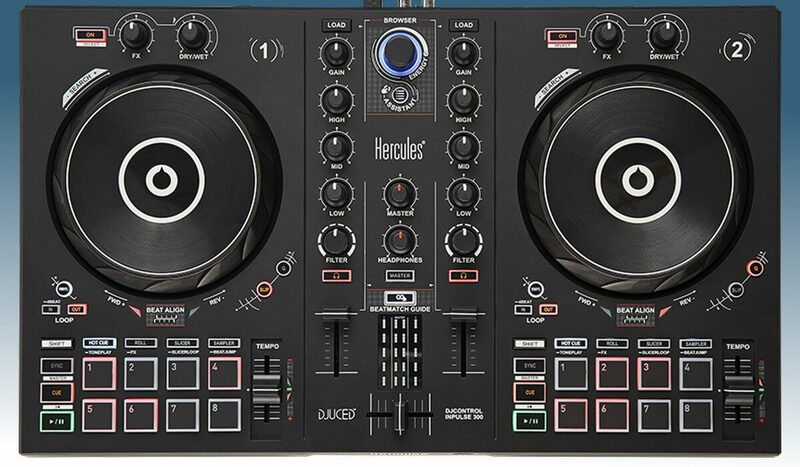 The DJUCED software was also updated and looks much more mature now, and includes an Intelligent Music Assistant and access to training videos the Hercules DJ academy. Also, there are no longer different version of DJUCED for different packages. 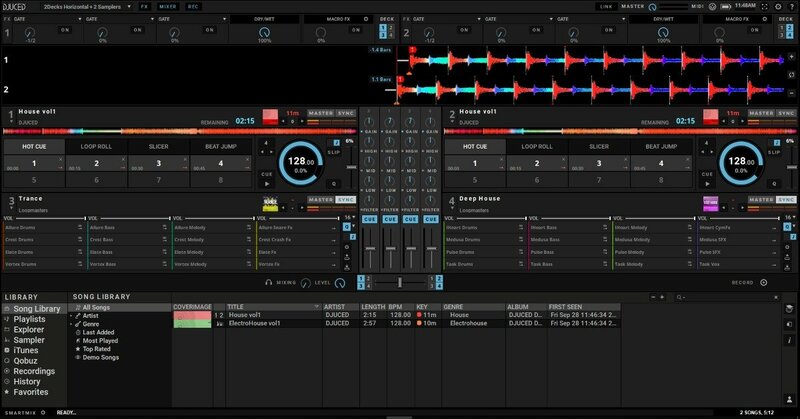 DJUCED works across all Hercules controllers, and that’s the way it should be. We will look into DJUCED separately in the very near future, so stay tuned for that!